PM Netanyahu says he was prevented from questioning State's witnesses against him twice. Prime Minister Binyamin Netanyahu delivered a statement on the investigations against him Monday night. The prime minister claimed that he had sought to question the State's witnesses in the investigations, but was prevented from doing so twice. ""The judicial system is one of the foundations of Israeli democracy," Netanyahu said. Quoting former Prime Minister Menachem Begin, he stated that "there are judges in Jerusalem. So it was, and so it will be." Netanyahu said that he was "ready for a live confrontation so that the public knows the truth. I am certain of my innocence." 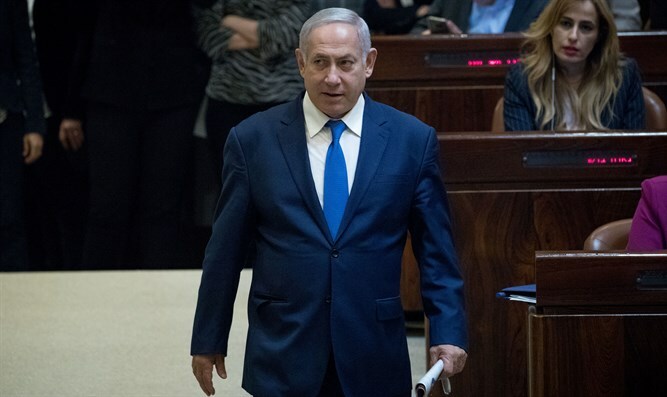 The prime minister dismissed the allegations of Case 4000, known as the 'Bezeq-Walla Affair,' which is considered the most serious and damaging of the investigations against him. He noted that the case was about "positive coverage which I never received." He accused those behind the investigations of double standards for failing to investigate his political opponents for some of the same things he is under investigation for. "How is it that you did not interrogate Yair Lapid, who met dozens of times with (Yediot Aharonot publisher) Noni Moses in a secret place?" he asked. Netanyahu accused the Israeli left of attempting to bring him down through the investigations since they could not defeat him at the ballot box, saying that he "won't make the concessions" the left wants from him, such as his resignation. Demanding the right to confront his accusers, Netanyahu also claimed that witnesses who could defend him "were not called to testify." "I am not afraid, I have nothing to hide," he said. "The prime minister also has the right to due process, I will cover all the things they say, because I know the truth and I am 4,000 percent sure of it," Netanyahu said.